Young carers in Burgess Hill were treated to an ‘Easter experience‘ yesterday. They took part in Easter bonnet making, crafts and a bunny hunt, at an event held at Westall House care home in Horsted Keynes. The event was organised by Burgess Hill Youth. The care home in Birch Grove Road also organised duckling viewings for the 11 young carers. 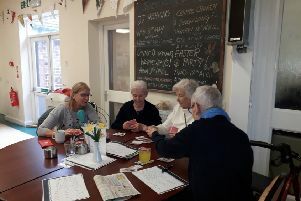 Jennifer O’Grady, projects and administrative officer, for Burgess Hill Town Council, said: “Burgess Hill Youth took 11 young carers to Abbeyfield’s Westhall House for an Easter Experience. “The afternoon finished with a lovely Easter themed tea, bonnet parade and reading with the residents at the care home. “Burgess Hill Youth were very grateful for the opportunity to visit the lovely surroundings at the home and to receive a wonderful welcome. “Activities manager Heather Rogers ensured we all had a great time. Young carers are children and young people who help look after a member of their family who is sick, disabled or has mental health problems, or is misusing drugs or alcohol.